FILE - African Union Mission in Somalia (AMISOM) peacekeepers from Burundi patrol after fighting between insurgents and government soldiers on the outskirts of Mogadishu, May 22, 2012. On March 6, 2007, African Union peacekeepers deployed in Mogadishu to help protect the Somali government, then facing a fierce onslaught from Islamist militias. 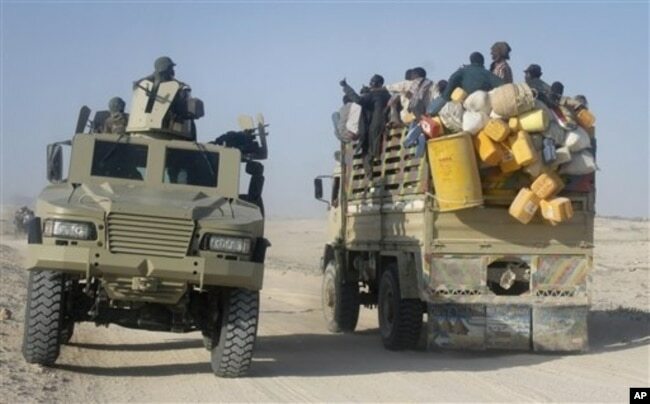 A full decade later, the AU troops remain the main source of protection for the government and they still patrol major roads linking the Somali capital to the regions, to the dismay of Somali Defense Minister Abdulkadir Sheikh Ali Dini. Dini says it’s particularly distressing that after 10 years, Somalia has not built an army capable of taking over security duties from the African Union Mission in Somalia, known as AMISOM. FILE - Ugandan soldiers serving in the African Union Mission in Somalia (AMISOM) patrol in a formation near the Jilacow underground cell inside a national security compound after an attack by suspected militants in Mogadishu, Aug. 31, 2014. “Halfway through this anniversary period, we should have readied the army to secure the country but we did not achieve this as planned, both as a government and people,” Dini told VOA’s Somali service. Now, analysts say that strengthening the army should be the No. 1 priority for the Somali government and newly-elected President Mohamed Abdullahi Mohamed, known as Farmajo. Time could be running out on AMISOM, as the countries that contribute troops to the mission — Uganda, Burundi, Ethiopia, Kenya and Djibouti — publicly float the idea of bringing their forces home. “[Farmajo] should turn his attention firmly on this and appeal to the West, the Arab countries, to give Somali troops proper training, equipment, salary,” said Rashid Abdi, Horn of Africa project director for the International Crisis Group. A lack of those essentials has hamstrung every attempt to develop a Somali army that can reliably protect the government and fight its enemies, especially the al-Qaida-linked militant group al-Shabab. After years of retreat, al-Shabab has resurged in the past 18 months, attacking AMISOM bases in remote areas and bombing several Mogadishu hotels, all with heavy loss of life. And what happens if AMISOM leaves before a Somali national army is ready to fight al-Shabab on its own? “What will happen is al-Shabab will retake the towns and Somalia will be in a lot of trouble,” Abdi said. FILE - East African civilians depart in a truck, right, as AMISOM forces advance on al-Shabab-controlled region, Somalia, Sept. 4, 2012. During a meeting Thursday between AMISOM and donor countries in Nairobi, the mission was praised for helping successive Somali governments survive. “It is obviously clear to everybody that without AMISOM, Somalia wouldn’t be where it is today,” said Albrecht Braun, a representative of the European Union. Al-Shabab controlled nearly all of the Somali capital before AMISOM-led offensives drove it out of Mogadishu and other Somali cities between 2011 and 2014. Somali government forces were involved in the operations, but mostly in minor and peripheral roles. 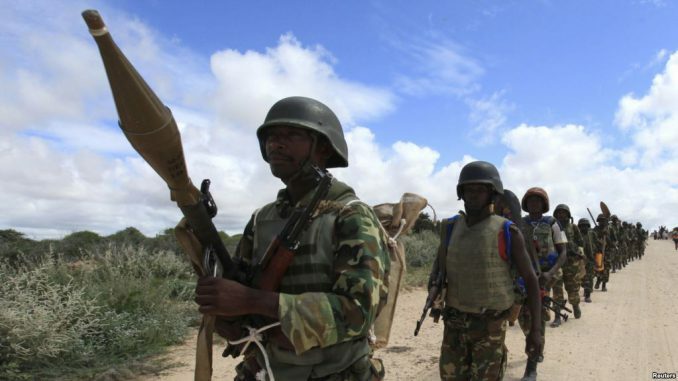 “AMISOM has been a crucial part of reducing al-Shabab from probably the No. 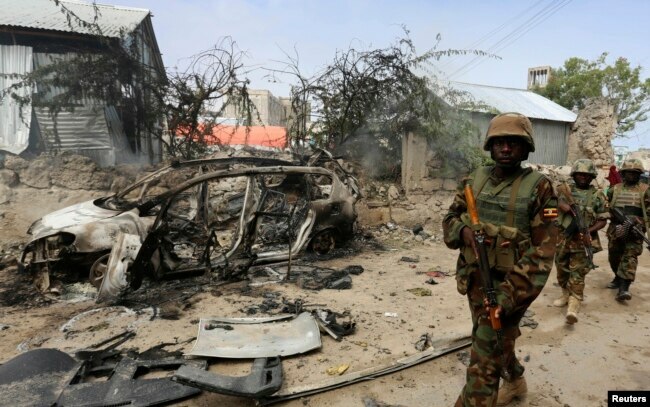 1 strategic threat facing the authorities in Somalia to just one threat than among several,” said Paul Williams, associate professor at the Elliott School of International Affairs, at the George Washington University. Along the way, the AMISOM countries have absorbed significant casualties. Apart from the ambushes, roadside explosions, and weekly skirmishes, attacks by al-Shabab on three isolated AMISOM bases resulted in the death of at least 215 AU soldiers. The deadliest attack happened in the town of El Adde just over a year ago. At least 140 Kenyan soldiers were killed, according to diplomatic sources. Kenya has not denied the reports. 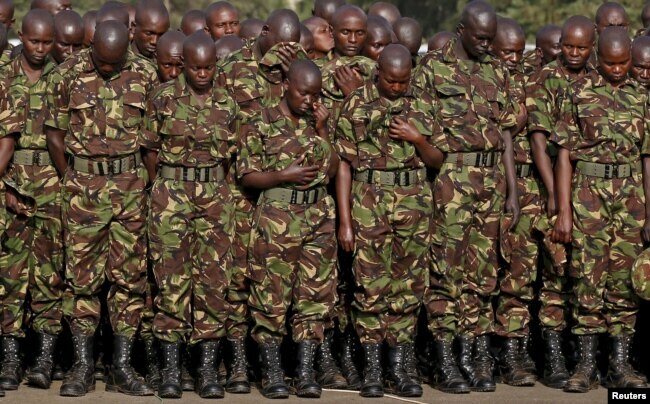 FILE - Members of the Kenya Defence Forces say prayers to pay respects to the Kenyan soldiers serving in the African Union Mission in Somalia (AMISOM), who were killed in El Adde during an attack, at a memorial mass at the Moi Barracks in Eldoret, Jan. 27, 2016. Williams believes the mission is probably the deadliest peacekeeping operation ever anywhere in the world. He says that from the beginning, AMISOM has had too much work on its hands. “It has been asked to conduct counterinsurgency and stabilization operations and to help rebuild and reconstruct institutions in arguably the world’s most collapsed state,” he said. More recently, AMISOM has faced constraints as donors cut 20 percent of the mission’s budget last year. And the mission never received key assets that were authorized by the United Nations, including helicopters, specialist units, engineers and medical units, according to Williams. AMISOM currently numbers 22,000 troops from its five contributing countries. Somalia has long planned to build and train an army of equal size, but those plans have not come to fruition. Defense Minister Dini blames the situation on the “lack of a clear plan” by the international community. He also blames the war with al-Shabab, saying the government had to train soldiers and fight the militant group at the same time. Williams squarely blames what he calls Somalia’s “political elites,” who he says have not come up to a “consensus on a political settlement” which would enable outsiders to help build an army. Somalia’s central governments have rarely functioned during the past 25 years, although hopes are high that Farmajo, who was elected with broad support in parliament, can make things run more smoothly and, in particular, make sure that Somali soldiers are paid on time. Dini has urged the Somali people to pay taxes and support efforts to rebuild the army. After the Murder of Two U.N. Experts, What Next for Congo’s Peacekeeping Mission?